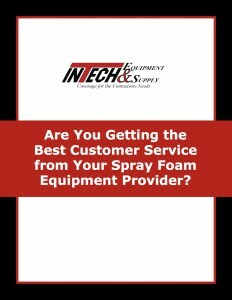 Home > Blog > Spray Foam Equipment > Are You Getting the Best Customer Service from Your Spray Foam Equipment Provider? In an effort to meet customers where they are today, we believe it’s important for companies to realize that superior customer service – especially in the Spray Polyurethane Foam (SPF) insulation and equipment industry – isn’t just about the way you greet and serve your customers. Rather, it involves the unique ability to offer a strategic combination of extensive knowledge and manufacturer support to assist professional contractors throughout the equipment purchase process and beyond. Are You Receiving the Best Possible Service? Does your equipment provider offer same-day or next-day customer service? Does your equipment provider offer a collaborative approach to customer support? Does your equipment provider boast a nationwide footprint? Does your equipment provider avoid topics, like warranties and coverage? The new eBook, which you can download for free here, highlights how the best kind of customer support goes the extra mile, encompassing everything that can help maximize the after-sales experience—from parts, parts delivery service and training to maintenance and repair.